Good food doesn't need to be so complicated! 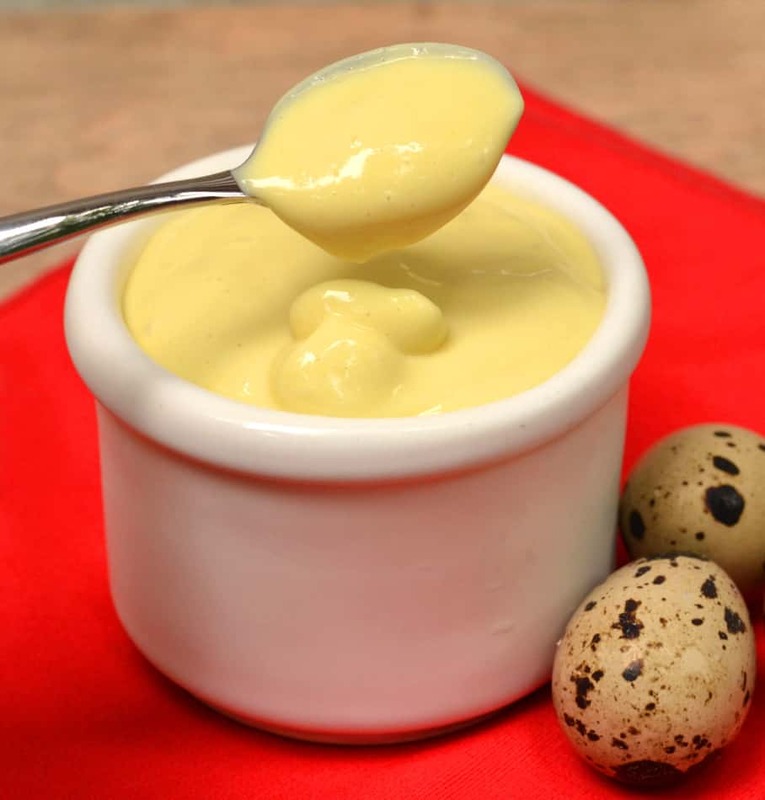 Simple & delicious Mayonnaise made with quail eggs. Better than the store bought stuff plus no salmonella risk from raw chicken eggs that go in most homemade mayo. There are four favorite condiments in my home. Ketchup, mustard, mayonnaise and chipotle hot sauce. Pretty typical for most Americans. Everyone loves the mayo. Admittedly, it’s not the healthiest option in the world of condiments. Store bought stuff often contains soybean oil as the first ingredient. You know we can do better than that. 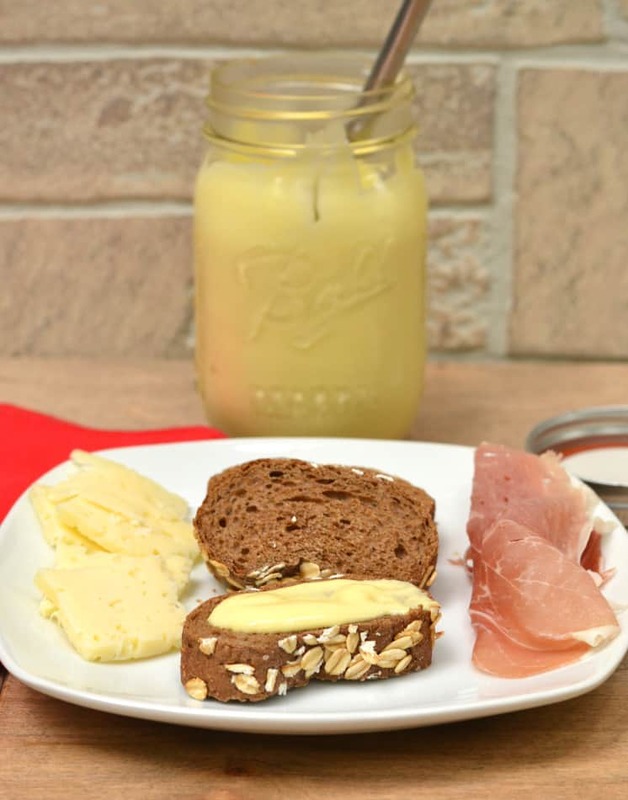 Homemade mayo and aioli have been all the rage for the past couple years. For good reason – made fresh, they taste so rich, so real – so much better. There’s one problem here, though. Raw eggs. 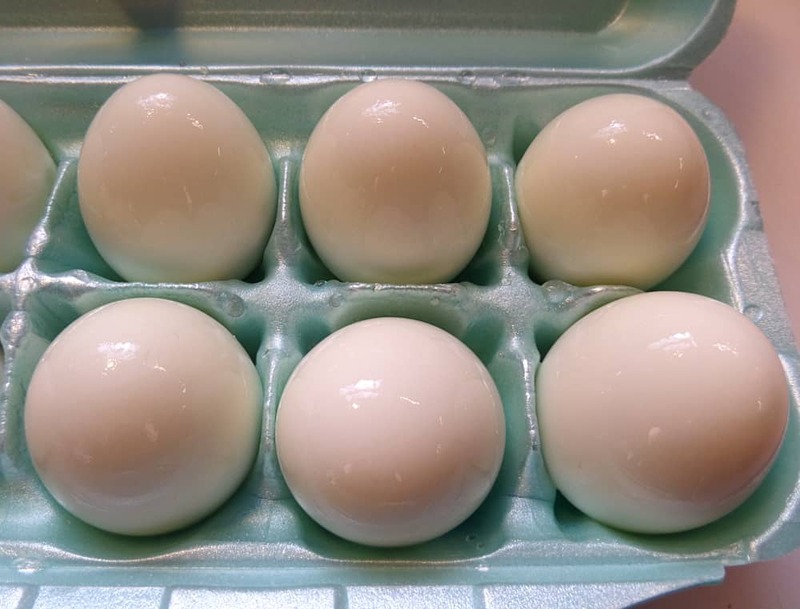 Raw chicken eggs are a recipe for disaster – it’s called salmonella. I hear nonstop ramblings about how organic, fresh, free-range eggs are safe and recommended. I’ve said it before and I’ll say it again & again – no one should be eating raw chicken eggs. I have fresh, organic, free-range eggs from birds I’ve hatched as babies. These eggs are available to me daily. They’re so fresh, they’re still warm. As a responsible chicken owner, I would not suggest anyone eat eggs raw – nor will I do so myself. So here’s where the wonders of quail eggs come in. These mini egg laying birds and their eggs are completely void of salmonella. Their eggs have an increased amount of lysozyme and they hold a body temperature higher than that of chickens. Some people consider it a waste to eat these eggs anyway but raw. This mayonnaise whips up pretty effortlessly with just a few hands on ingredients. I use my food processor, but a blender would work just as well. The only note I have to add is to make sure you slowly drizzle the other half of the oil in while mixing. Dump it in too quickly and you’ll end up with blobby, oily yuckiness. I make this mayo with half olive oil & half avocado oil. Canola oil works great too. Use whatever oil you prefer. You can also add herbs, spices, various flavored vinegars – whatever your mayo loving heart desires. Hope you enjoy! Thanks for stopping by! Read more I’ve written on the wonderful little quail egg here. 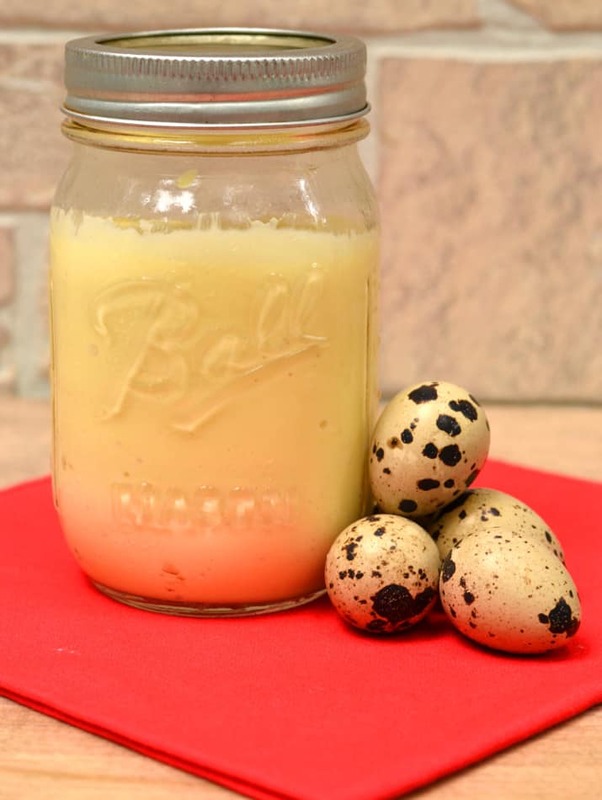 A simple & delicious mayonnaise made with quail eggs. Using a food processor or blender - add in 1/2 cup of oil, quail eggs, vinegar, honey, mustard & salt. Blend until completely smooth, stopping once to scrape sides & bottom. While your food processor is running - SLOWLY- drizzle in remaining oil. Blend until oil is completely mixed in and mayo is smooth and creamy. Store covered in fridge - I use a mason jar. This mayo should chill in fridge for a few hours before using - allowing flavors to blend. 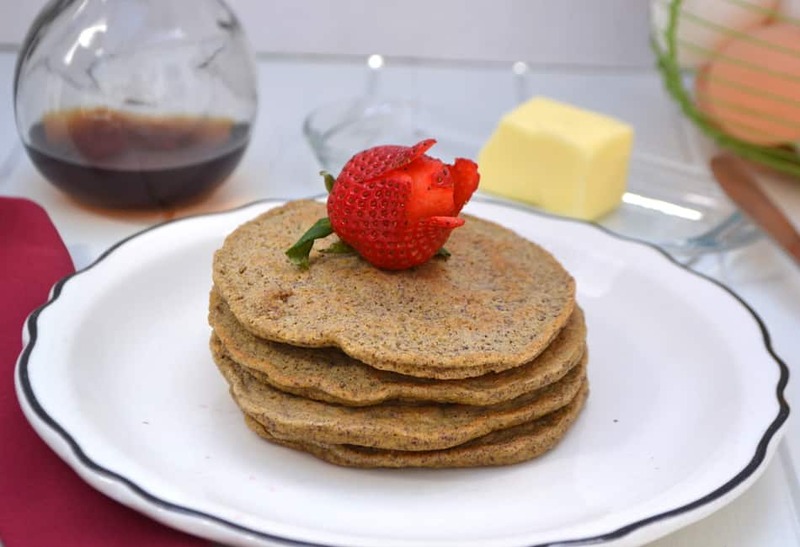 Light, fluffy and tender Low Carb Flax Pancakes that are ridiculously simple to make. 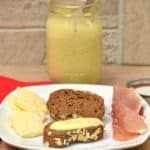 Awesome breakfast for Carb Counters & Diabetics – but great for anyone who enjoys a healthy breakfast! Pancakes. People love them. Pancake options, combinations and toppings are endless. The humble pancake has been reinvented a million different ways and people still find joy in getting creative with them. With a diabetic in the family I had to rethink my pancake recipes. I worked on some whole wheat pancakes and coconut flour pancakes, both delicious and will be shared in the future. But I knew I could do better. The flavor and textures were great – but I knew I could get lower with the carbohydrate numbers. I knew the solution as well – the almighty ground flaxseed meal. I love ground flax. It’s an ingredient I use often – it tastes great, is filling, packs some serious nutrition and it’s cheap! I add it to yogurt, smoothies, to many of my baked goodies and I love making breakfast foods with it – I make a mean flax porridge and endless flax mug muffin combinations. I knew with a little coaxing it would take on pancake form perfectly. I found a few recipes online to try and start with – like always, it’s a lot of trial and error. When I finally found something that worked I just about fell in love. Simple, to the point, and tasted like a pancake you would want to eat any given morning. 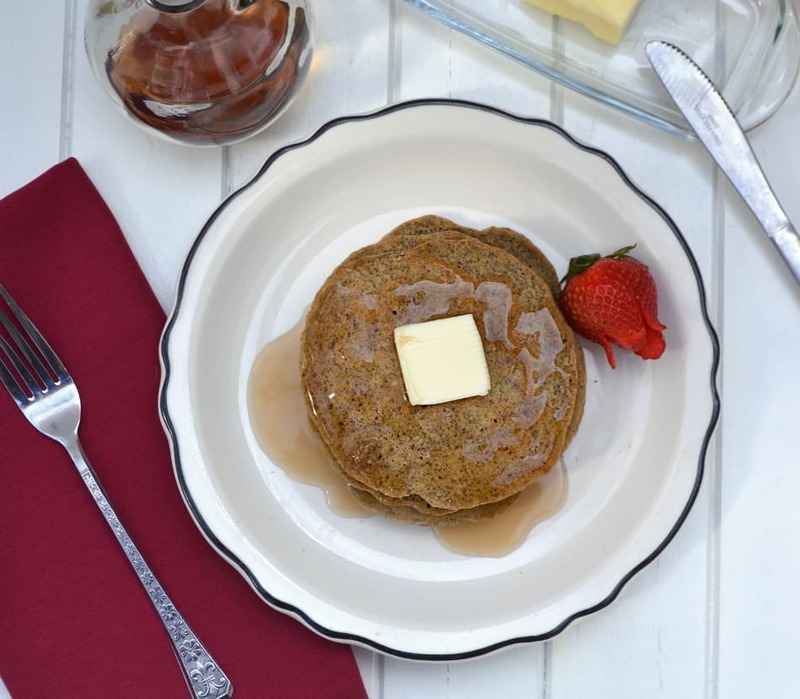 You’ll definitely know that it’s not your regular all-purpose flour pancake, but man-oh-man, it sure is surprisingly close. Light, fluffy and tender – with a drizzle of syrup some might not even notice the difference. My family was in disbelief. My daughter loves them and says they remind her of “French Toast Pancakes”. Seriously, people without any dietary restrictions can appreciate this pancake as much as those who have to count carbs. 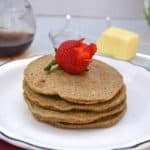 Flax pancakes for all! 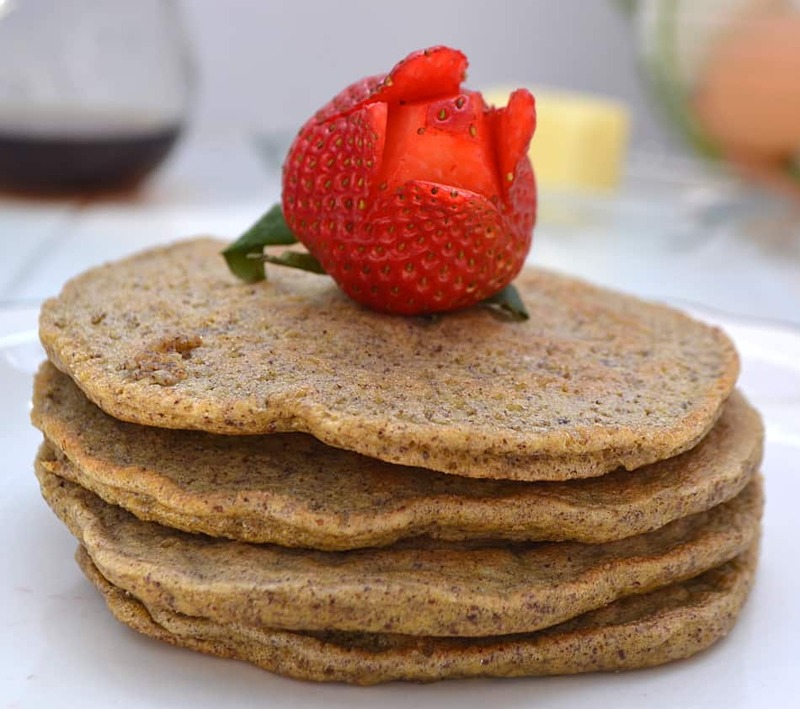 Recipe adapted (just a tad) from Unbreaded – check them out for lots of low-carb goodness. 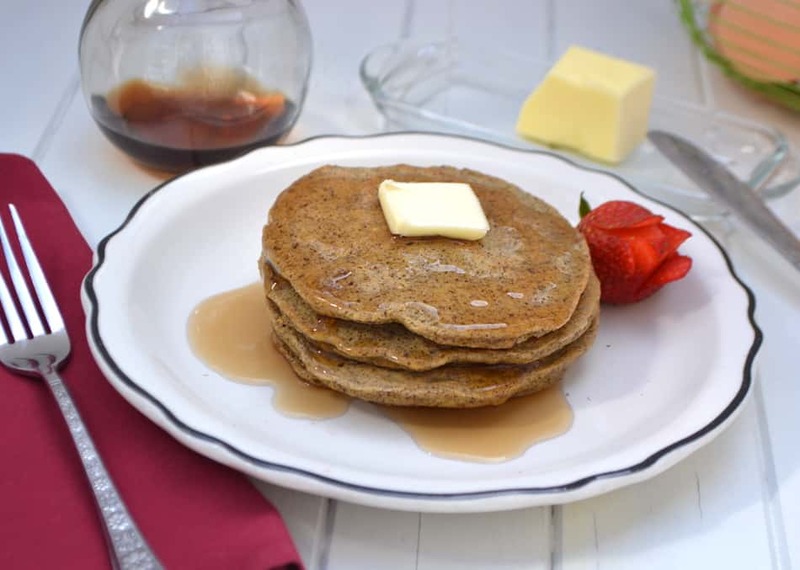 Light, fluffy and tender Low Carb Flax Pancakes that are quick & simple to make. Awesome breakfast for Carb Counters & Diabetics - but perfect for anyone who enjoys a healthy breakfast! In a small bowl combine flaxseed meal, stevia, baking powder, cinnamon and salt. Whisk in eggs and vanilla extract. Add butter to griddle or frying pan and heat to medium heat. I set my griddle at about 250°F. Pour out pancakes in about 1/4 cup portions - I use a ladle. You should get 4 - 5 pancakes. Cook for 3-5 minutes or until set and golden brown, flip and cook for another 2-3 minutes. NOTE This recipe makes about 4 pancakes - 1 hearty serving. Recipe can easily be tripled or doubled. 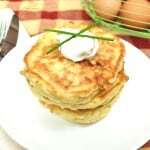 These pancakes are great made ahead and reheated. 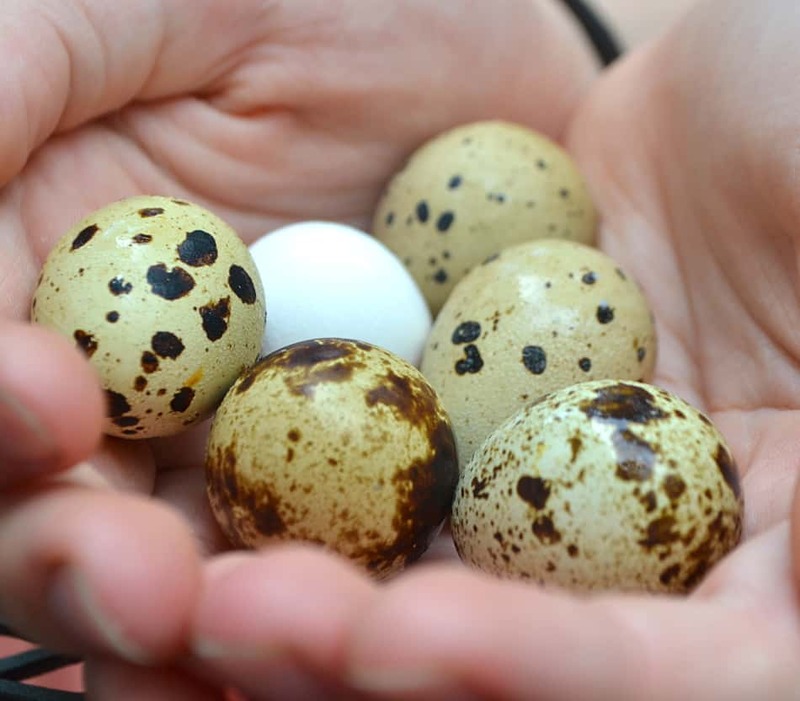 All about Quail Eggs. 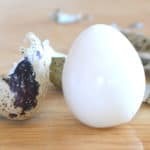 How to hard boil quail eggs, peel & crack quail eggs and other quail egg stuff you need to know. It’s a not so funny thing. I have chickens. My hens are loved and well cared for, free ranged & eat the best of the best. They’re happy, spoiled little chickies, living the good life. In return, they graciously give us fresh eggs. Seriously, some of the best eggs ever. Beautiful marigold yolks tell the tale of the quality of the chickens diets. Then as luck would have it, I find myself suffering from an egg allergy. Scratch that, it’s an egg intolerance. An egg allergy causes a serious allergic reaction from just trace amounts. So far (knock on wood) I can eat a slice of cake that has an egg or two in the batter, but I can’t eat a scrambled egg. I tried changing the chickens food & diets. No luck. I tried eggs from other free range farms. No luck. I tried gluten-free, gmo free eggs from another farm. Nope. I tried various store bought eggs. No dice. I was convinced that duck eggs would be the answer. Then quail eggs. Then guinea hens eggs. I was sadly mistaken. It was one sad failure after another. Moving along. The “pity-party” is over. I’m seeing another specialist in the near future that can hopefully help me with some of these depressing food allergies. I was going to start raising quail this year. 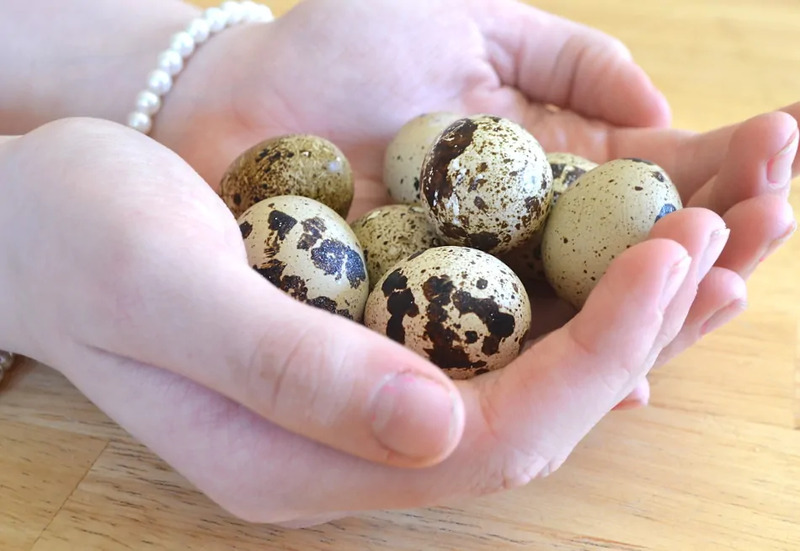 My family loves quail eggs and I have a super-picky little eater who requests “tiny eggs” so I always keep a few dozen around. Besides being bite-sized and absolutely adorable, there are a few other differences. I have always preferred them over chicken eggs. They have a higher yolk to white ratio which gives you a much richer egg. The flavor of chicken eggs & quail eggs are very similar – but – I find that boiled quail eggs do not need to be salted. Quail eggs are a bit more nutritious. I won’t bore you with the details but you can read the breakdown of nutrition info on both eggs here. The other interesting thing is that quail eggs can be eaten raw. I have vocally expressed my opinion against eating raw chicken eggs a few times before. It’s a BIG no due to the risk of salmonella. I constantly hear it’s okay to use fresh, organic chicken eggs from small, local farms raw. Sorry, it’s not. I have fresh and organic eggs every single day – so fresh, they’re warm. Guess what – I’m not consuming any of those eggs raw. So back to the quail eggs. They’re safe to eat raw – so using them in mayo, aioli, pastas, mashed potatoes, desserts, protein shakes, booze – whatever – it’s all good. A lot of folks recommend eating the shell for added health benefits. I’ve always passed on that one. 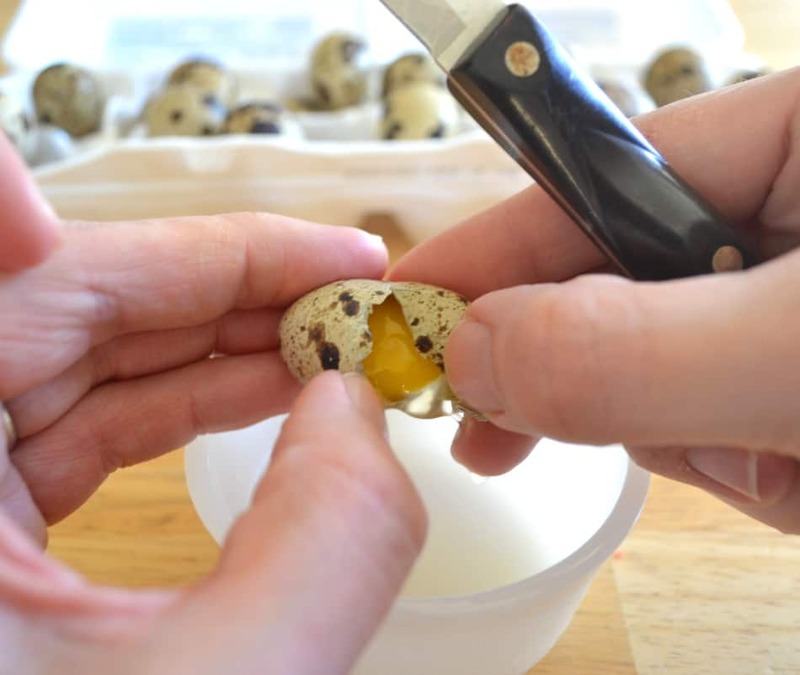 Quail eggs are a bit tricky to crack, but I’ve found a small sharp knife does the trick. I crack it with the knife & then cut it open. I crack a few at a time in a bowl if I’m frying or scrambling them. 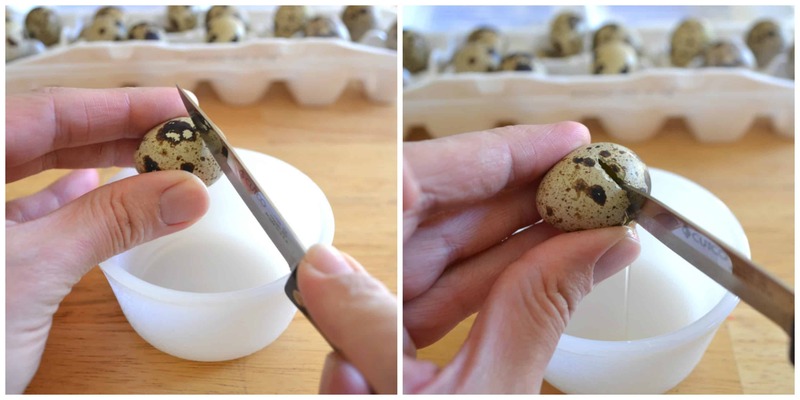 I recently bought a little cutter gadget for quail eggs – it does makes the job easier. 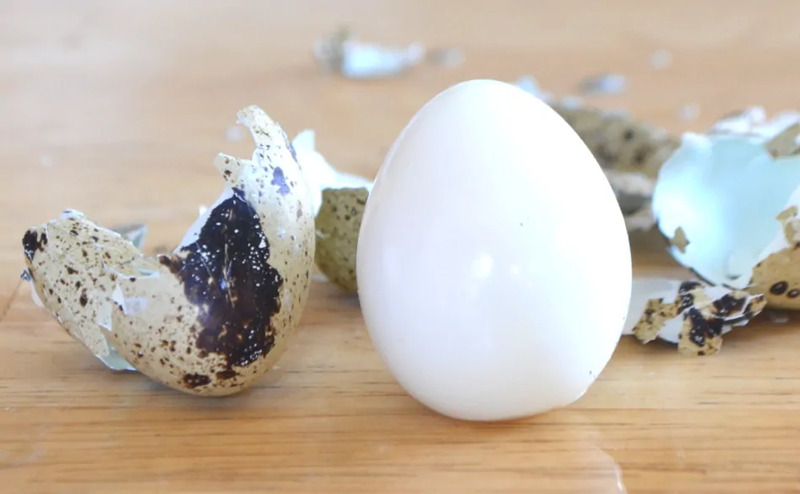 Peeling boiled quail eggs is tricky if you don’t cook them the right way. 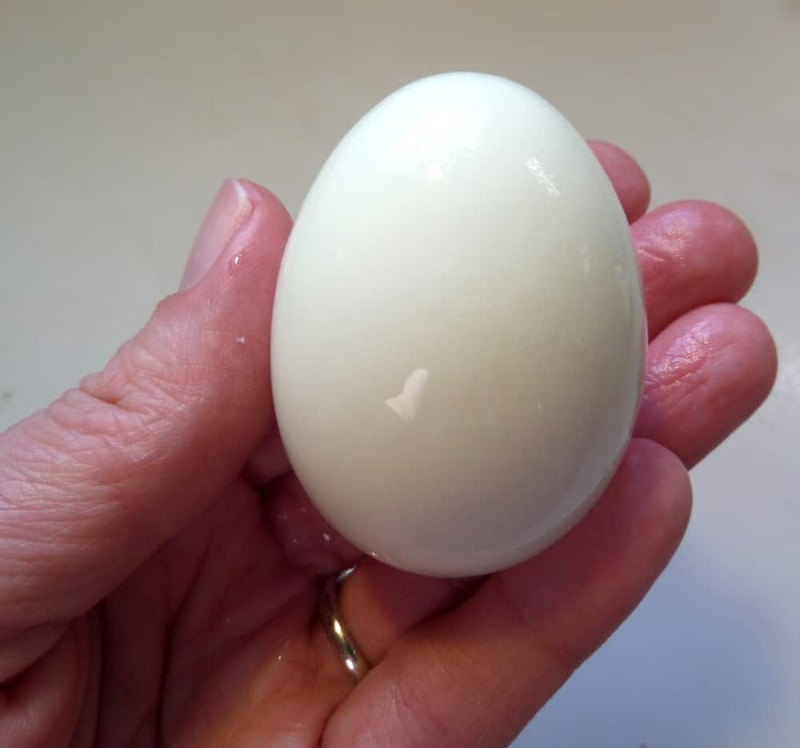 (Recipe follows) When peeling, gently crack the bottom of the egg. I find it easiest to peel from the bottom, taking care to get under the membrane. My daughter finds it easiest to roll the egg between her hands, gently cracking the entire shell, and then peeling. 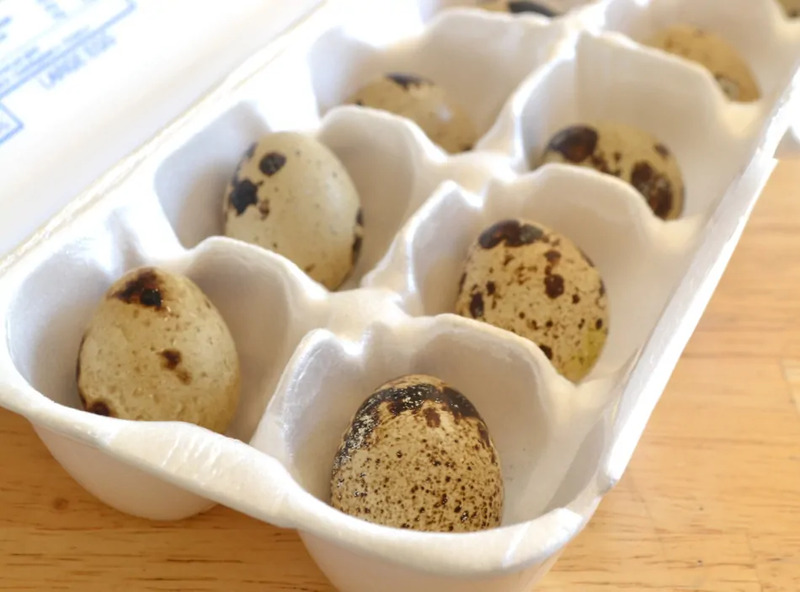 If you wanted to bake with quail eggs – you would substitute 3-4 quail eggs for each large chicken egg. I have one more piece on eggs to share yet and will probably publish it in the next few weeks. I’ll be comparing quail, guinea, chicken & duck eggs – it’s a glimmer of egg happiness in these sad egg-free times for me. Lol. Fill an appropriate sized saucepan with enough water to cover eggs by one inch. Do not add eggs yet. Bring water to a full boil. Gently add eggs - I lower them in with a slotted spoon. Maintain a light boil and cook for 3-4 minutes. Carefully drain hot water and fill saucepan with ice cold water. I find hard-boiled quail eggs are best served warm. Peel & serve or refrigerate until ready to use. This post contains affiliate links. This means that if you were to make a purchase through one of these links, Crafty Cooking Mama would receive a small percentage of the sale price, but you won’t have any additional cost. Any revenue made from sales through these links helps to support the costs of running this blog. Thanks for reading & thanks for your support! Breakfast. I absolutely love it – after 10:00 am. I’ve never been a morning person, but I’ve adapted over the years. Early riser I am, early eater – not so much. Coffee is all my body requires until 10ish. So I suppose my daily eating habits would be “Coffee, Brunch, Lunch & Dinner”. It works for me. Most days I prefer to eat simple breakfasts. Over easy eggs on an English muffin tends to be my go-to. I love eggs, and with a flock of happy free ranging chickens, I always have a surplus of the most amazing eggs ever to use. Some days I enjoy fussing a bit more over my first meal of the day. 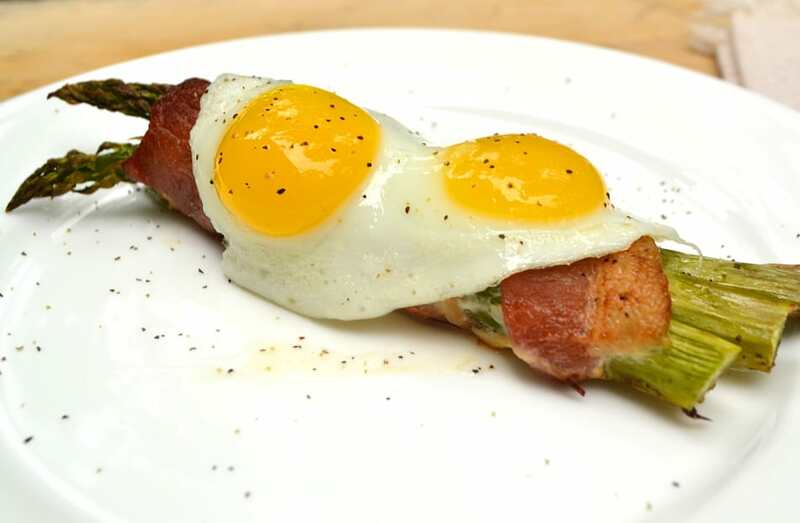 With fresh asparagus, bacon and quail eggs staring back at me from my fridge – this meal just had to happen. I am not a bacon fanatic and wrapping everything in bacon doesn’t overly excite me. That being said, there is a time & a place for everything. Like here & now. 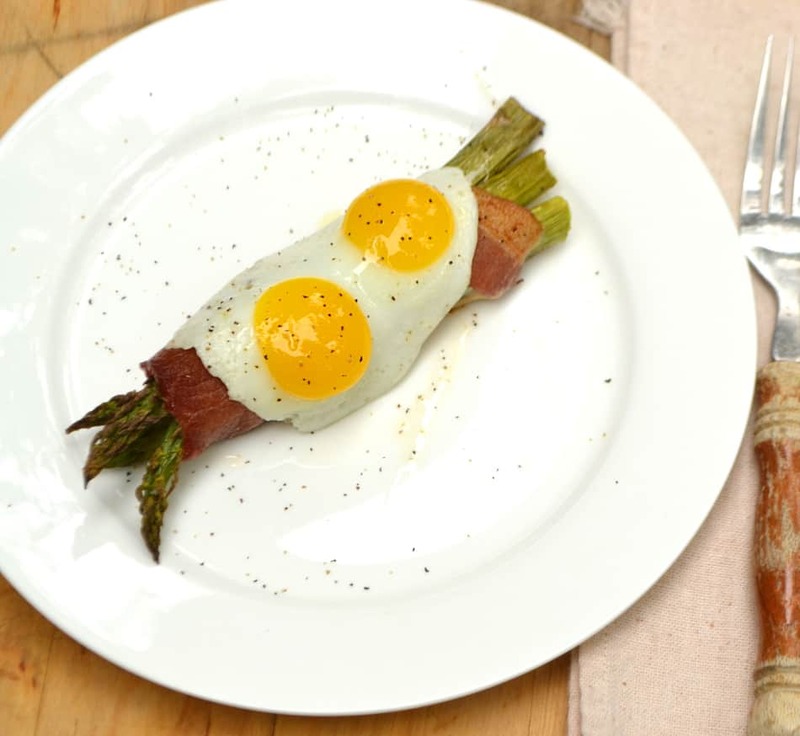 Just as you thought roasted asparagus couldn’t get any better – you go and try it wrapped it in bacon. Yum. Quail eggs. They’re a lovely treat and I’m always happy when I get my hands on them. They don’t taste much different than a chicken egg – perhaps just a bit richer. You treat them just as you would a chicken egg, just adapt cooking time for a smaller egg. Though a bit more special than my usual breakfast eats, this meal is still simple as simple can be. 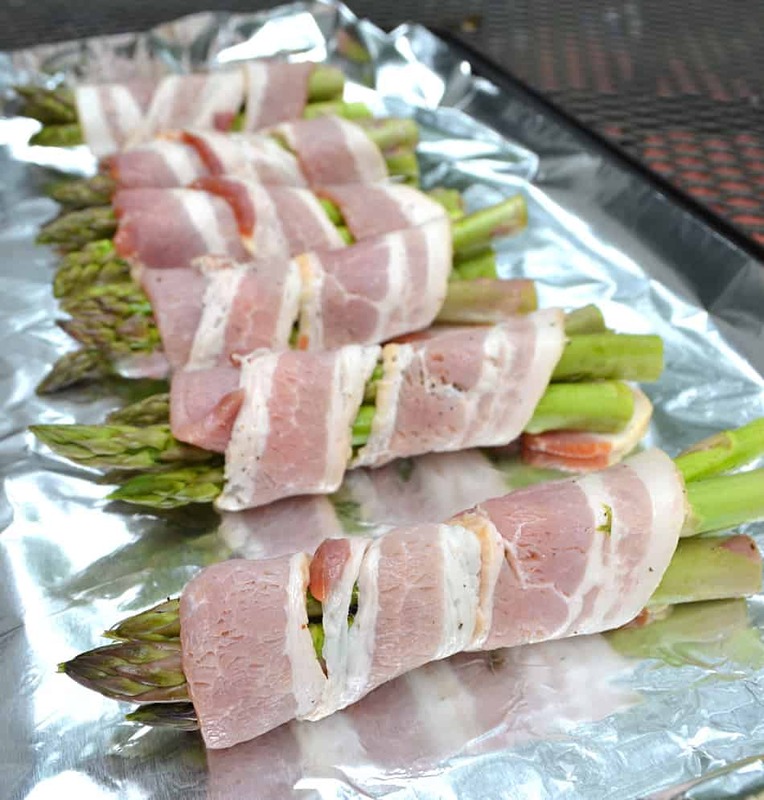 Prep the asparagus, wrap it in bacon and toss it in the oven. 30 – 35 minutes later it’s done. 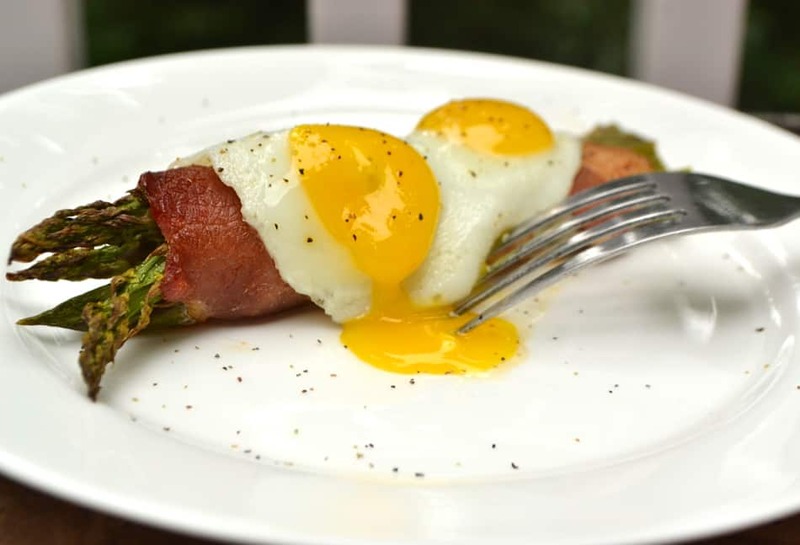 Fry up a few quail eggs in butter for a minute or two, slide them onto your asparagus and you’re ready to eat. This breakfast is easy enough to be made any day of the week. It’s wonderful served as breakfast, brunch, lunch or dinner – cause really, who decides what’s deemed breakfast. This meal would definitely impress brunch time guests. Oh, and if you can’t find quail eggs (though you really should try) you could certainly serve this with chicken or duck eggs. Enjoy! Thanks for stopping by! Create bundles of asparagus - 3-4 pieces each bundle. Plan on 4 pieces for average size asparagus, 3 pieces for thicker stalks. Salt and pepper each bundle and wrap bacon around bundle, wrapping upwards at an angle. Spritz any unwrapped areas (tips & ends) with olive oil. Place on cookie sheet and bake for 30 -35 minutes. 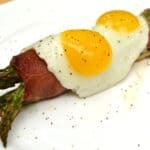 Asparagus should be tender and bacon should be browned and crisp. Fry quail eggs in a generous amount of butter over medium heat for 1-2 minutes. 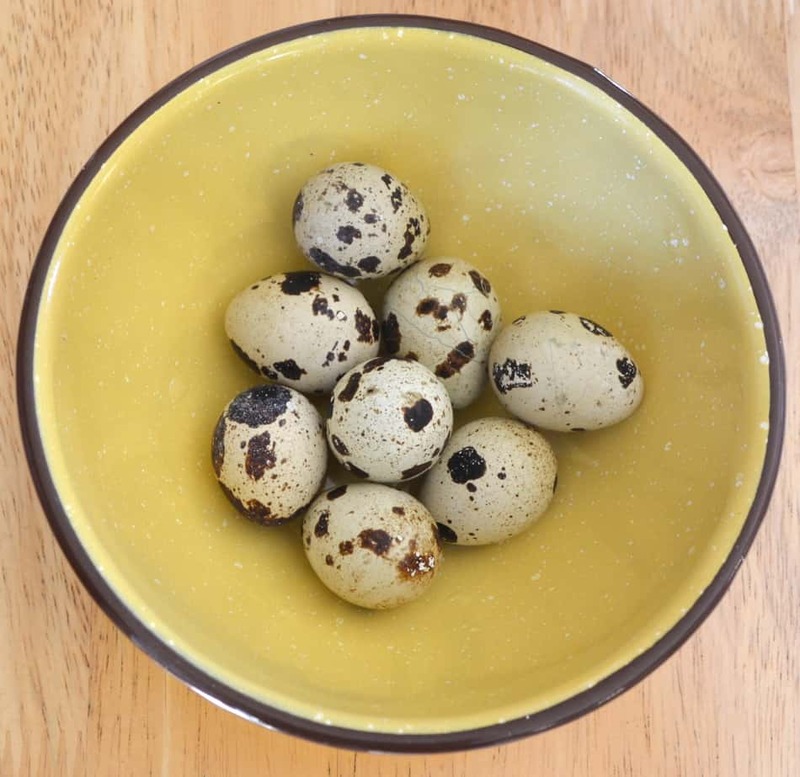 I find it easiest to crack quail eggs with a butter knife into a small bowl, in pairs, and pour from bowl into frying pan. 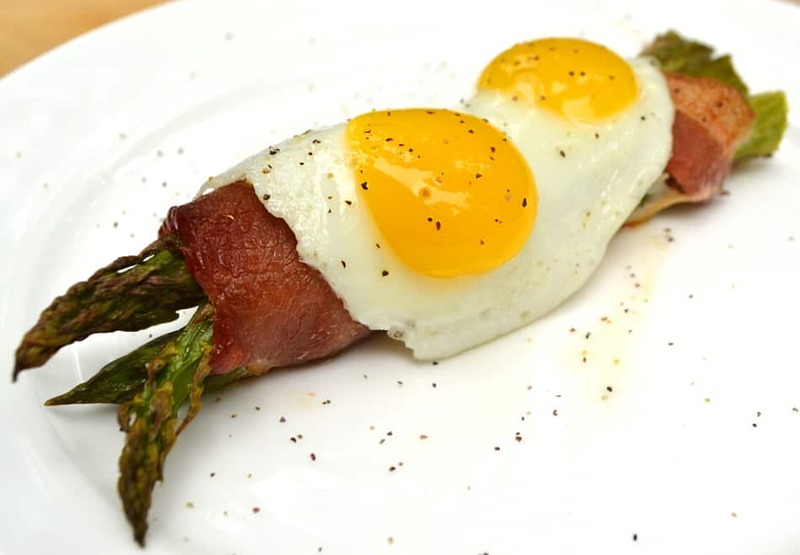 Slide pairs of cooked eggs on top of asparagus bundles. Salt & pepper to taste. Serve immediately. 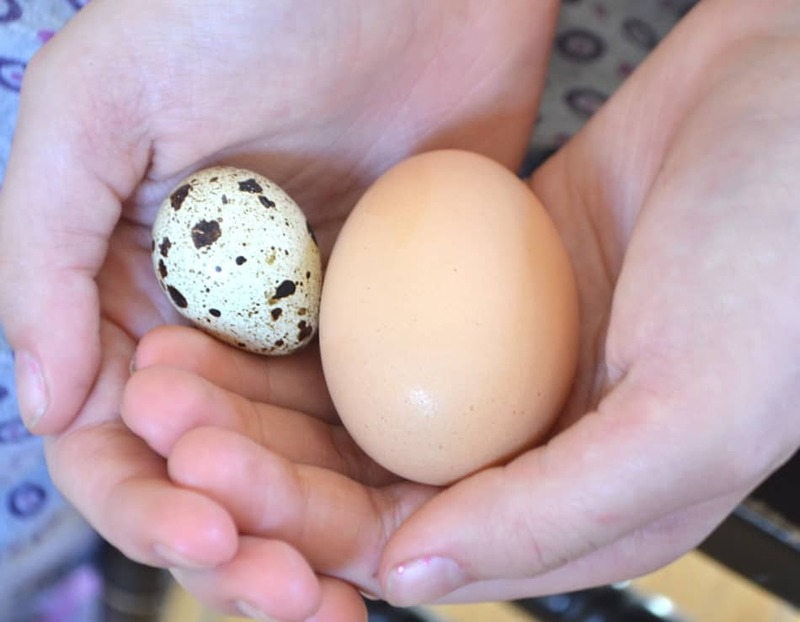 Note: Chicken or duck eggs may be substituted if quail eggs are not available. 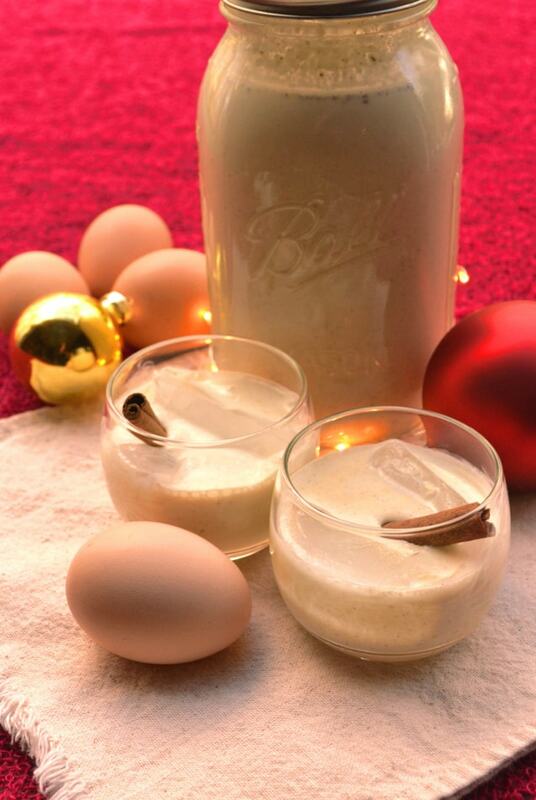 Boozy Eggnog without the raw eggs. Enjoy this thick, creamy & delicious drink made with heated eggs, cream, brandy and rum. Happy Holidays! I can’t resist making a batch of eggnog every year! It’s a fun, boozy, delicious, creamy, super rich drink just for the holidays. I have a few different recipes I make, today I’m sharing a family recipe. I’ve made one big change to this recipe over the years – I no longer use raw eggs in it. The eggs are still there, they’re just heated to a safe temperature. Someone had told me a few years back that I was taking the fun out of eggnog by no longer using raw eggs. Seriously? I was kind of taken back by that. I wasn’t aware that salmonella was part of the party. So why is everyone so nonchalant about raw eggs? The story is “everyone has eaten raw cookie dough for years and has never gotten sick.” That may be so, but eggs still test positive for salmonella. Others will say it’s okay to use fresh raw organic eggs from small, local farms. Really? I have chickens. I have fresh and organic eggs every single day – so fresh, they’re warm. Guess what – I’m not consuming any of those eggs raw. So here’s the reality of the matter. If you’re okay with the risks associated with consuming raw eggs, that’s fine – go for it. If you’re making this drink for others to enjoy, it’s just irresponsible to serve it uncooked. It’s best to err on the side of caution. So all you have to do is heat the sugar, eggs and half of the cream together for a few minutes in a saucepan until it reaches 160°. Pull it off the heat, stir in the remainder of the ingredients, bottle and refrigerate. That wasn’t so bad, now was it? 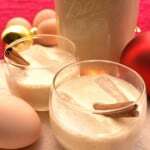 I hope you enjoy this recipe for eggnog! Get to making it the next day or two and it will be prime drinking for Christmas day! Happy Holidays! 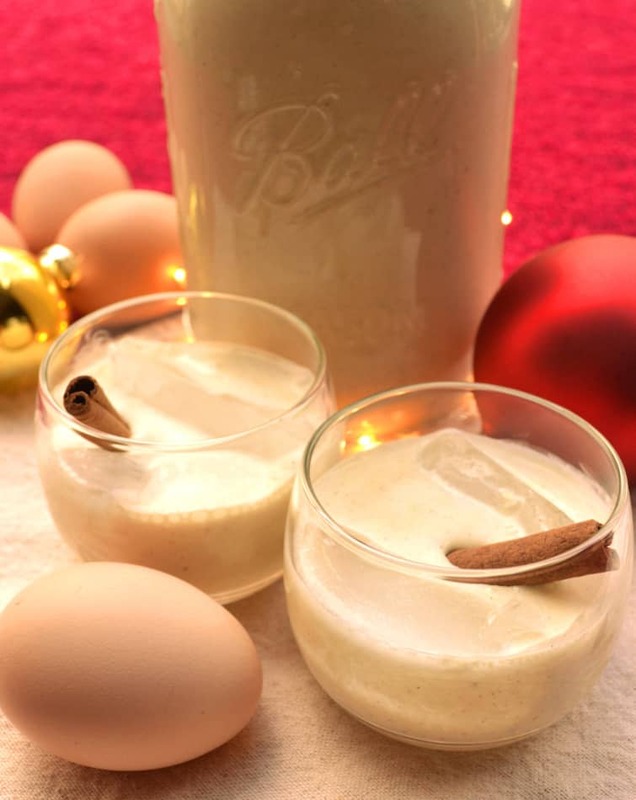 Boozy Eggnog made without the raw eggs! 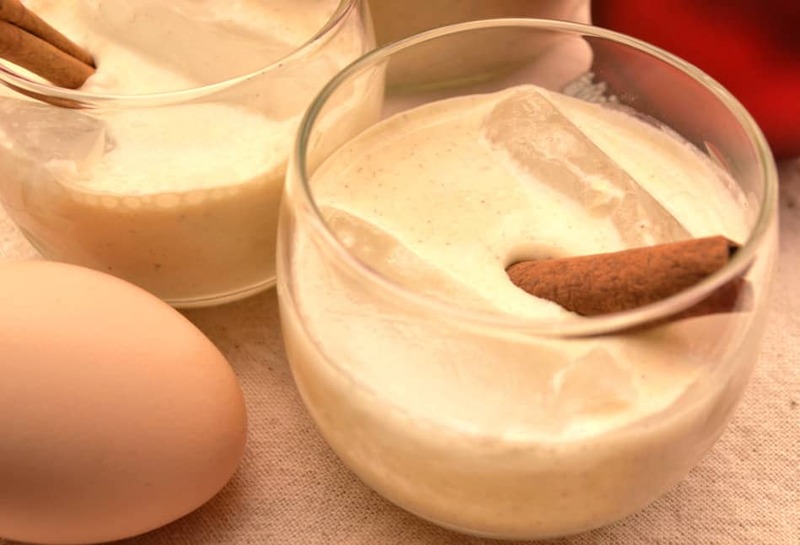 Enjoy this thick, creamy & delicious drink made with heated eggs, cream, brandy and rum. A holiday favorite! In a large saucepan, whisk together eggs and sugar. Whisk in 2 cups of cream. Cook over low/ med-low heat for approx 5-10 minutes. Stir constantly, do not allow mixture to boil, until the temperature just reaches 160°. Stir in cinnamon, nutmeg, remaining cream, brandy and rum. Pour into lidded bottles and jars and refrigerate. 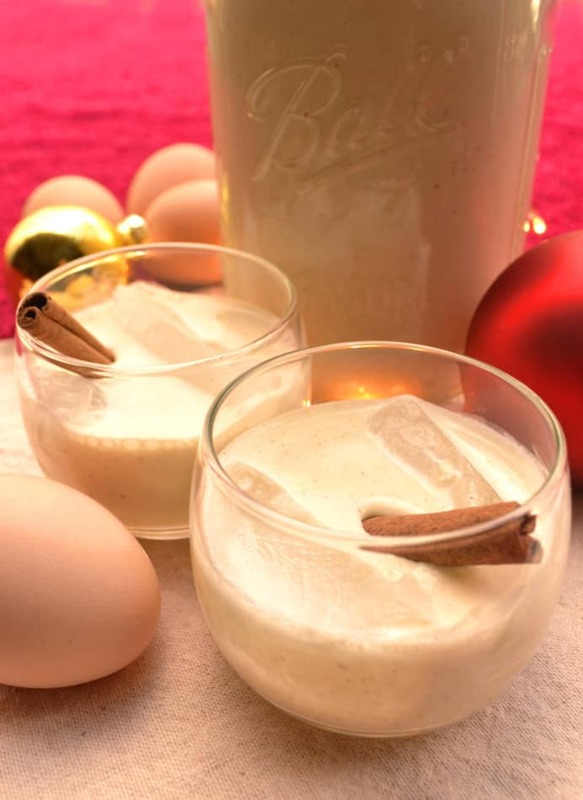 Eggnog needs at least a day, preferably two, to sit and allow flavors to blend before serving. 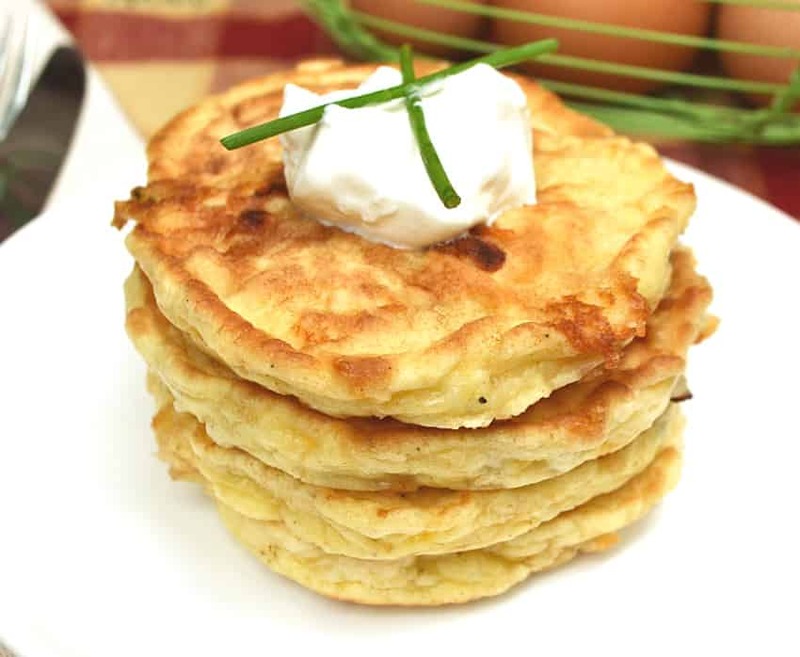 A perfectly simple and delicious Savory Egg & Cheese Pancake. Chickens!!! We finally got our small flock! Our whole family is so excited and we absolutely adore our chickie poos! They’ve all become happy and adjusted. The first morning we awoke to find that our girls left us eggs was so exciting – like Christmas morning. These chickies have it made! My husband went above and beyond the normal chicken coop – he built these girls the high rise penthouse of chicken houses! Much attention, thought and love is put into the care of our chickens. This is the first recipe I made with our hens eggs. I’ve been making these egg and cheese pancakes forever now. It’s a very basic recipe focusing on simply the eggs and cheese. That being said – use the freshest eggs you can get your hands on and your favorite good quality cheese. 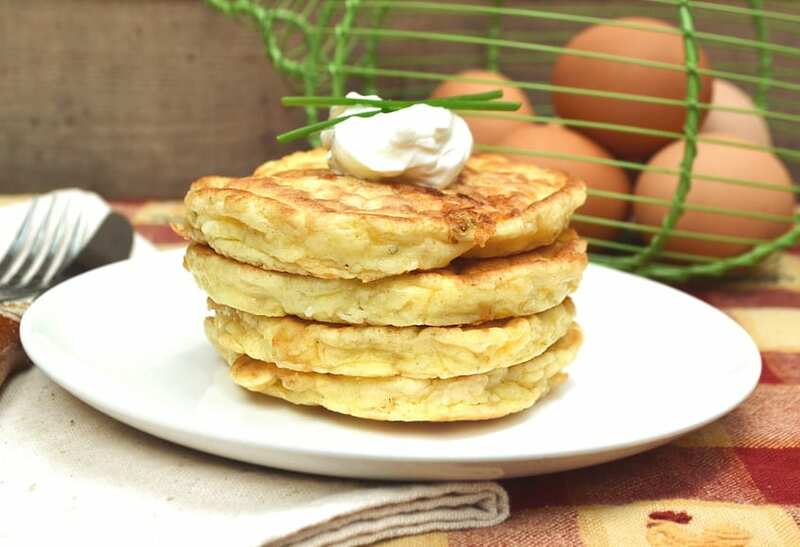 These pancakes are quick and easy to make and use average, on hand ingredients. I make them for breakfast, lunch or dinner. I serve it along side some fresh fruit, fried potatoes, bacon, sausage or even a bowl of grits. I fry these egg and cheese pancakes up on an electric griddle. Just like a regular pancake, I wait for the edges to start to bubble and flip them. Both sides should be nicely golden browned. Serve these hot, right off the griddle. Top with a small dollop of sour cream or eat as is. That’s it. Quick, easy and delicious. This has always been a family favorite and I’m sure we’ll be eating it a lot more frequently with the flux of eggs we’ll have. 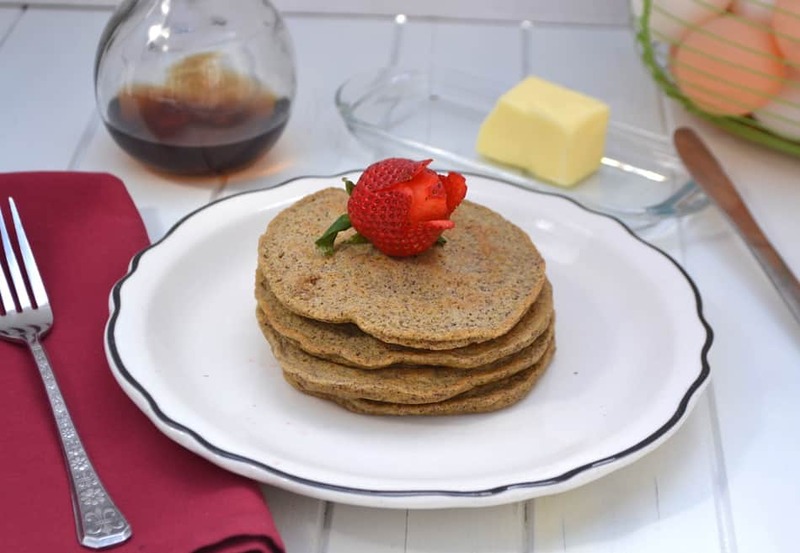 You can season these pancakes up however you like, add some fresh herbs, finely diced veggies or perhaps some crumbled bacon – this is a wonderful recipe to get creative with! Thanks so much for stopping by! I do hope you enjoy this recipe and I’d love to hear all about it! Happy Cooking! 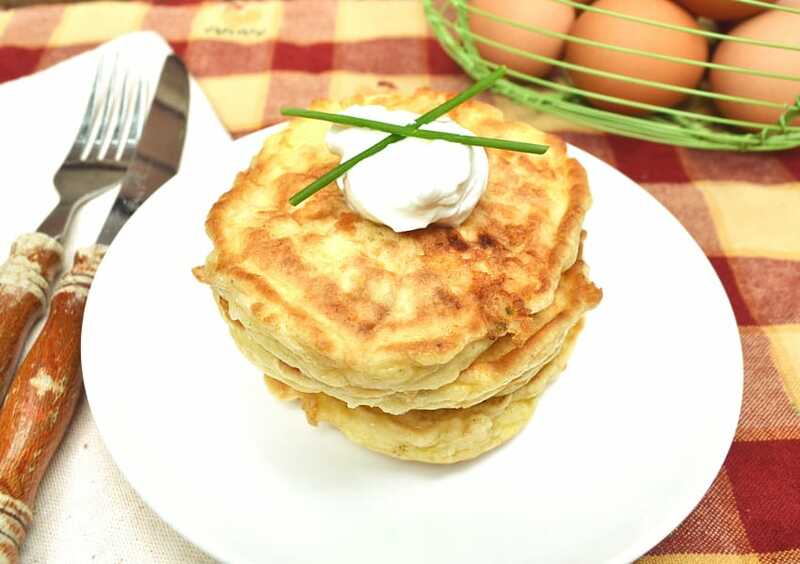 A perfectly simple and delicious egg & cheese pancake. In a mixing bowl, whisk together eggs, salt, onion powder, pepper and chives. Whisk in flour and baking powder until all lumps are gone. Heat butter on griddle at med/high heat - I set my griddle at 350. Pour desired amount of pancake mixture onto griddle. 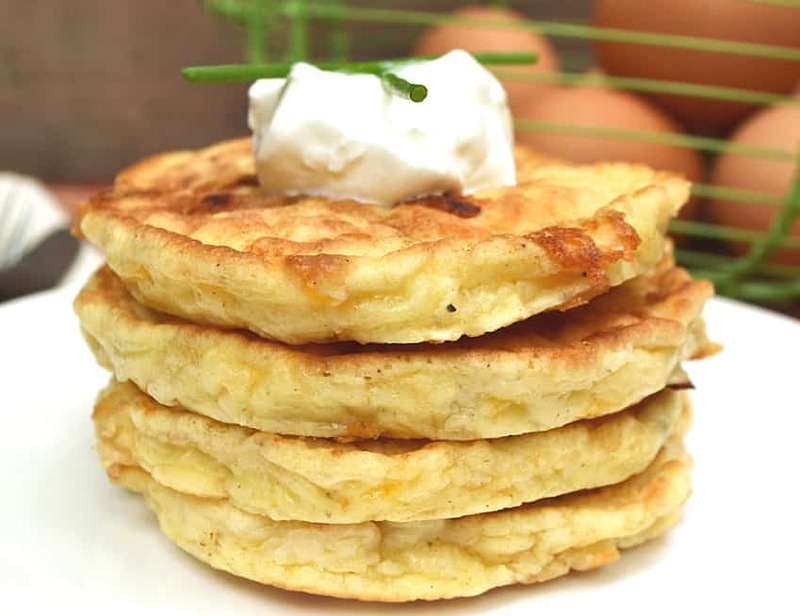 Lightly brown pancakes on both sides, just as you would regular pancakes, flipping once. Serve. Spoon a dollop of sour cream on top if preferred. Enjoy! Red Beet Eggs – a Pennsylvania favorite! 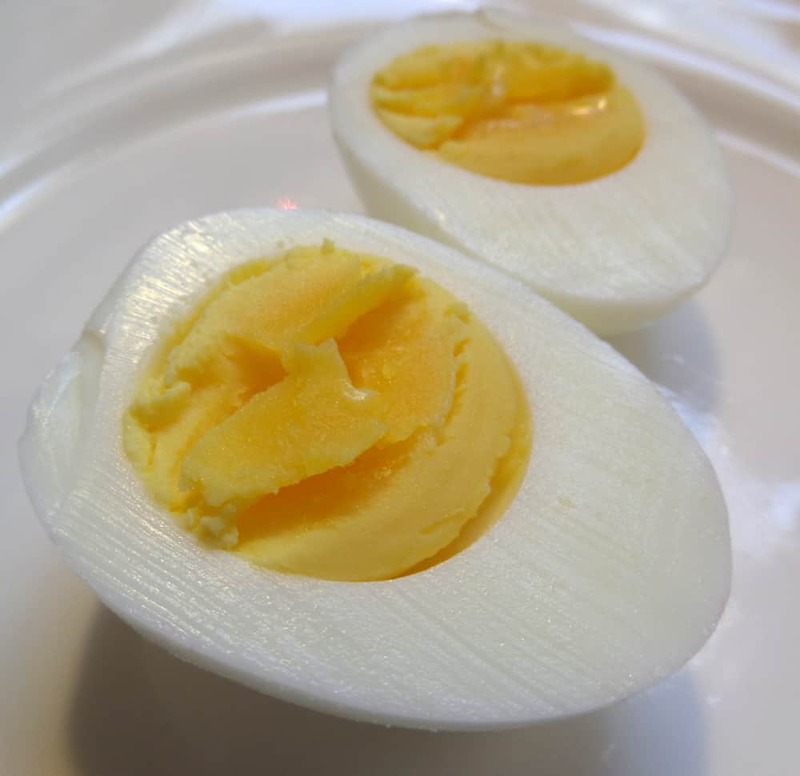 Sweet, tangy and sour – a unique take on your average hard boiled egg. Eggs, vinegar, red beets, salt and sugar is all you need! 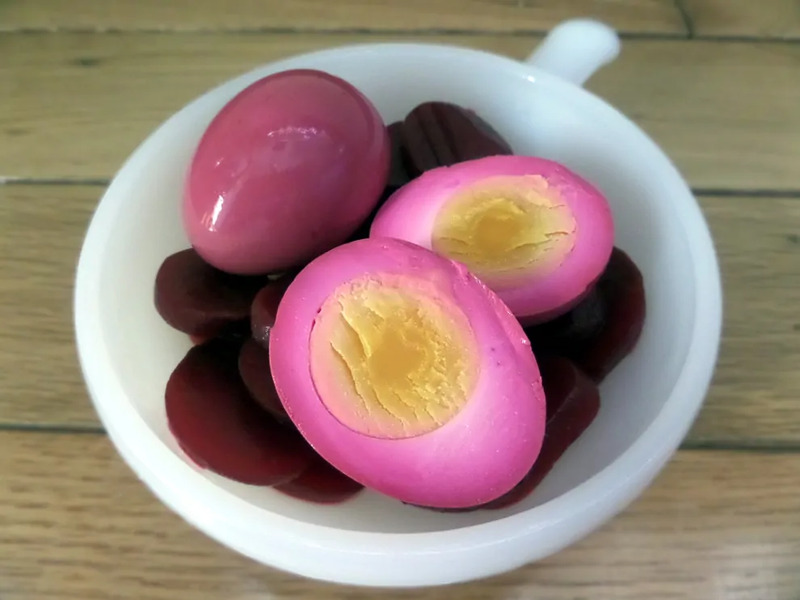 Red Beet Eggs. Also affectionately referred to as Red Beeters in my house. A simple staple of Lancaster County. I’ll rephrase that, they’re a staple of Pennsylvania. I fondly remember snacking on these as a kid. 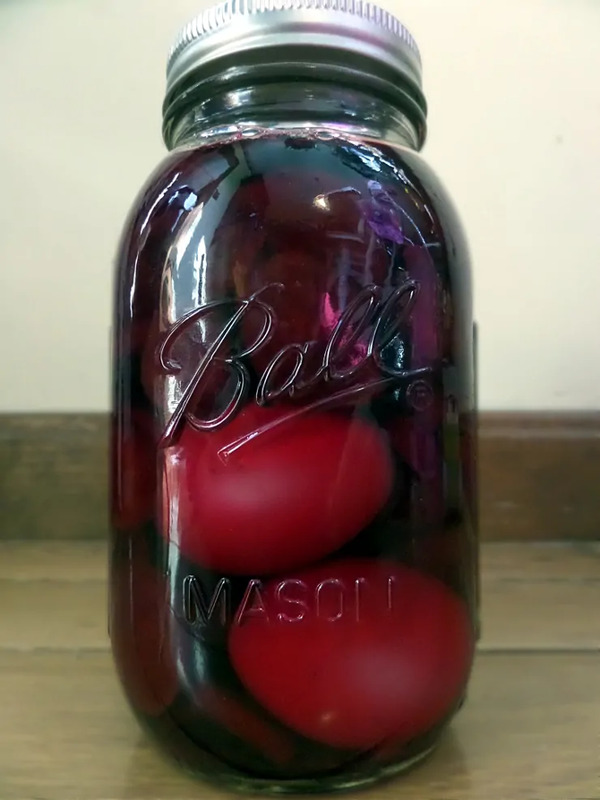 My grandmother Halina, a Polish immigrant who embraced the Pennsylvania Dutch cuisine, always kept a giant pickle jar filled with Red Beet Eggs. Every family has a recipe – all different but pretty much the same. Some of the die hard Pennsylvania Dutchies add cloves and cinnamon, I pass on both. Others will use pickling spice – I’ll pass on that too. 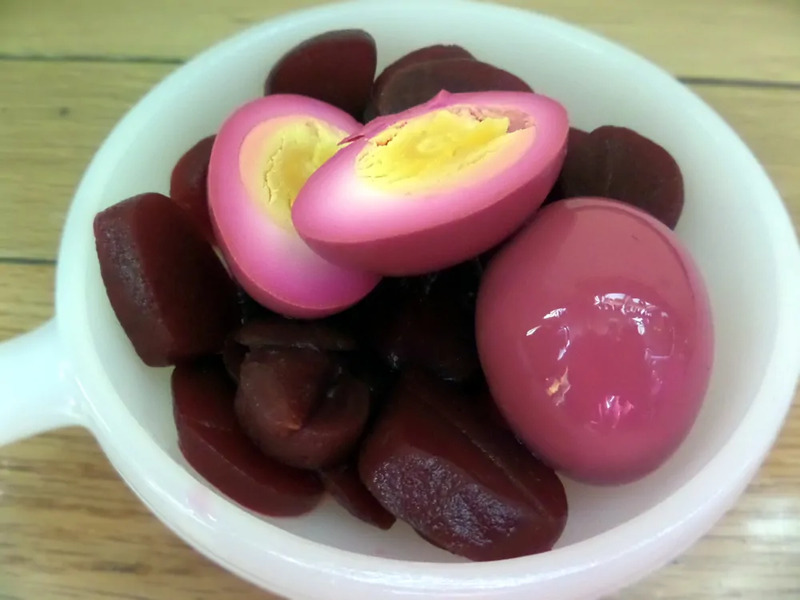 I’m a purist when it comes to my Red Beet Eggs – vinegar, salt and sugar is all I need. These eggs are simple to make. Just make sure you cook your eggs properly. Eggs that don’t peel well end up looking gross after turning that pretty purplish color. Like rotten zombie dinosaur eggs. Cute for Halloween – not so cute any other day of the year. 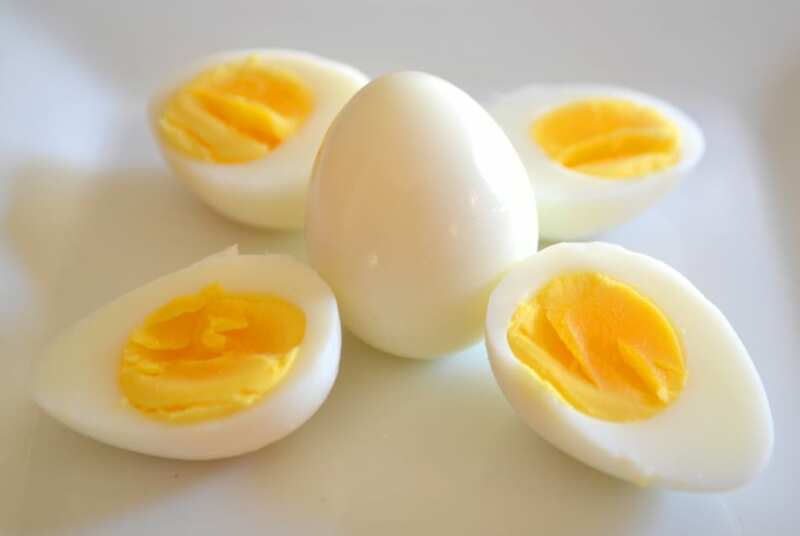 Need help making perfect cooked and peeled hard boiled eggs? No worries, I’ve got you covered. For six eggs I use a 24 oz mason jar – they fit perfectly. Combine the liquid from the beets, both vinegars, sugar and salt in a small saucepan. Bring to a boil, reduce heat and simmer for a few minutes. Have the peeled, hard boiled eggs in the jar with the beets on top. I prefer using small sliced beets – it’s nice to serve an egg with a big spoonful of small beets. Pour the liquid mixture in jar over the eggs. You’re best bet is to make these, throw them in the fridge, resist temptation and forget about them for a few days. After 3 days they’re about prime to eat. This recipe easily doubles or triples. We eat these as is. I usually serve an egg with a spoonful of the juices and a big spoonful of beets. Sweetish, tangy and sourish. Simple and delicious. They make a great snack or lunch. I never felt the need to salt the eggs while I eat them – but many people do. I’ve also seen deviled eggs made out of Red Beet Eggs. I’m a purist, I’ll pass. Try em’ out! Chances are, all you’ll need to pick up is a can of beets. These are simple to make and suprisingly different and delicious. Can’t wait to hear what you think! Thanks for reading! Red Beet Eggs - a Pennsylvania favorite! Sweet, tangy and sour - a unique take on your average hard boiled egg. 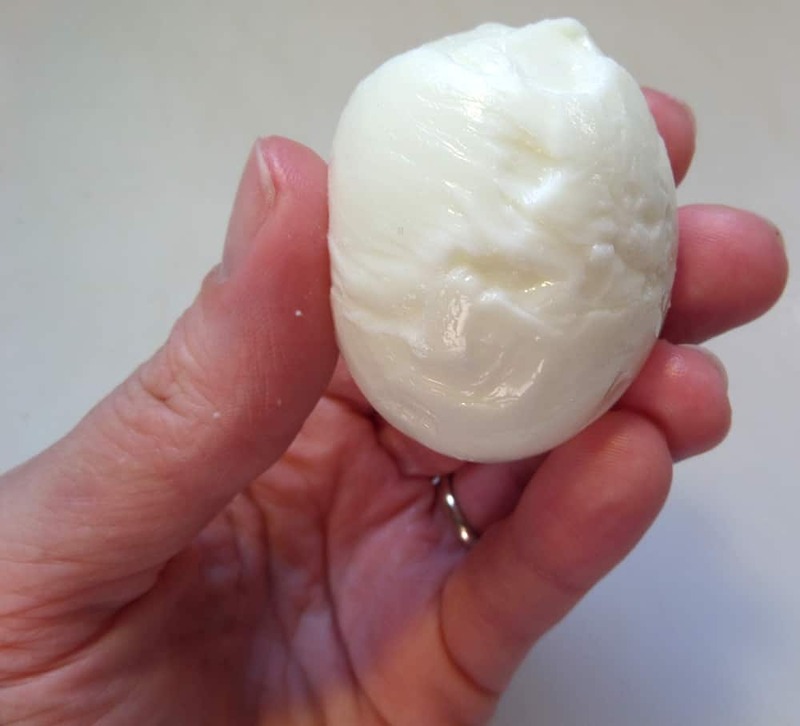 Cook, cool and peel eggs. Strain liquid from can of beets into small saucepan. Set beets aside. Combine both vinegars, sugar and salt with beet liquid in saucepan. Bring to a boil and simmer for 5 minutes. Put eggs in an appropriate sized jar. Put beets on top. Pour vinegar mixture over eggs and beets in jar. Cover and refrigerate. Try to forget about them for a few days - at least two days. Three days and they're awesome...a few days more and they're perfect. This recipe easily doubles or triples. Enjoy! 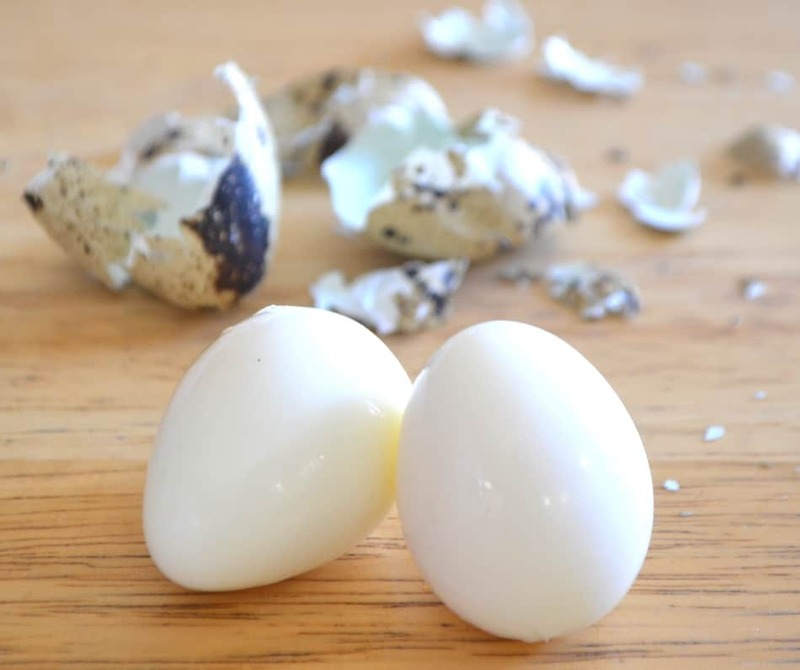 A simple method for perfectly cooked and easy to peel hard boiled eggs. A few weeks ago I made a couple dozen of red beet eggs. Sounds simple enough, right? Wrong. Peeling the eggs turned into a total nightmare. Who would think such an easy task could turn out to be so complicated. One of the first things we learn how to cook and many of us have been taught all so wrong. I’ve had the same method for cooking hard boiled eggs for years. Tried, true and they turn out perfectly cooked. Yellow, creamy yolks – no grayish greenish ickiness. So that’s all fine and dandy but they end up peeling and looking like a horror story. Then there’s method I was taught growing up – it’s the total opposite. The eggs peeled effortlessly but were rubbery and had green, dry crumbly yolks. So I need the best of both worlds – a perfectly cooked and easily peelable egg. Here we go….. Without a doubt out there is a whole science behind this. I’m not venturing into the whole explanation of it but here’s a great link explaining it all from Serious Eats…. The experiment is simple. 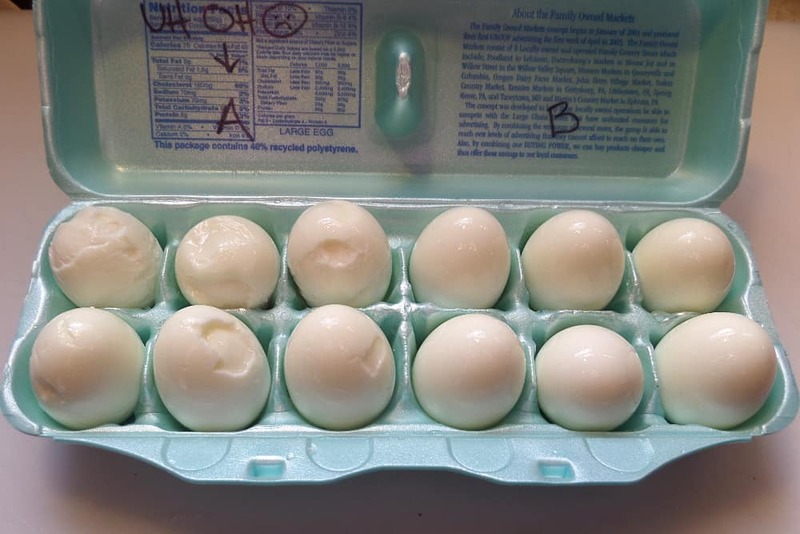 A dozen eggs – same batch – and two different methods. I opted to use a fresh dozen of eggs. I’ve always heard that older eggs peel better. Thing is though, I tend not to think that far ahead. I don’t pick up a dozen of eggs with intentions of aging them in the back of my fridge for when the hard boiled egg mood strikes. So we’ll keep it real and work with that most of us have tend to have on hand – fresh eggs. I’ve had my own chickens for over a year now and always have hard boiled eggs in my fridge. So fresh eggs to me now is “straight from the coop”. 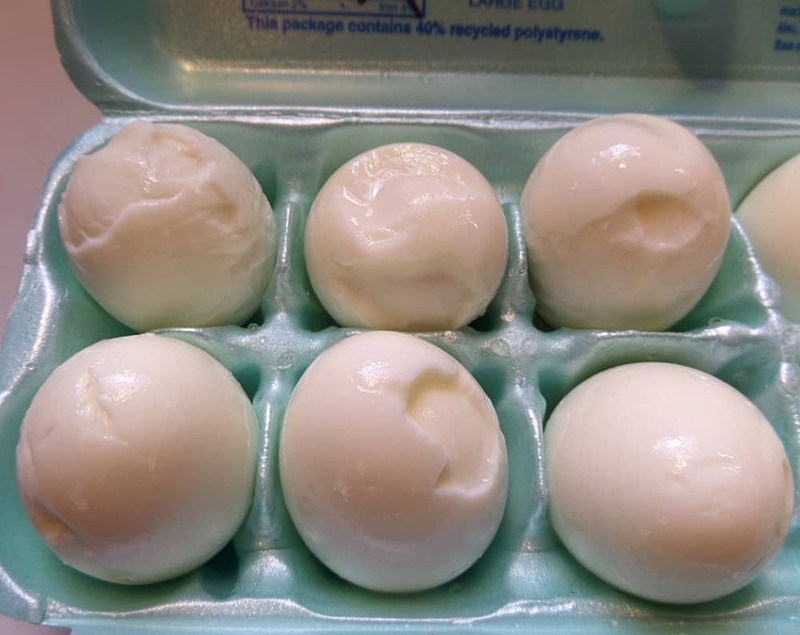 Eggs straight from the coop are not good hard boiled – they peel horribly. Wait at least 3 days before hard boiling fresh eggs. Anything you’re buying in the store is way older than 3 days, so you’ll always be good to go on cooking them up right away. I’ll explain the results at the end though the pictures pretty much speak for themselves. 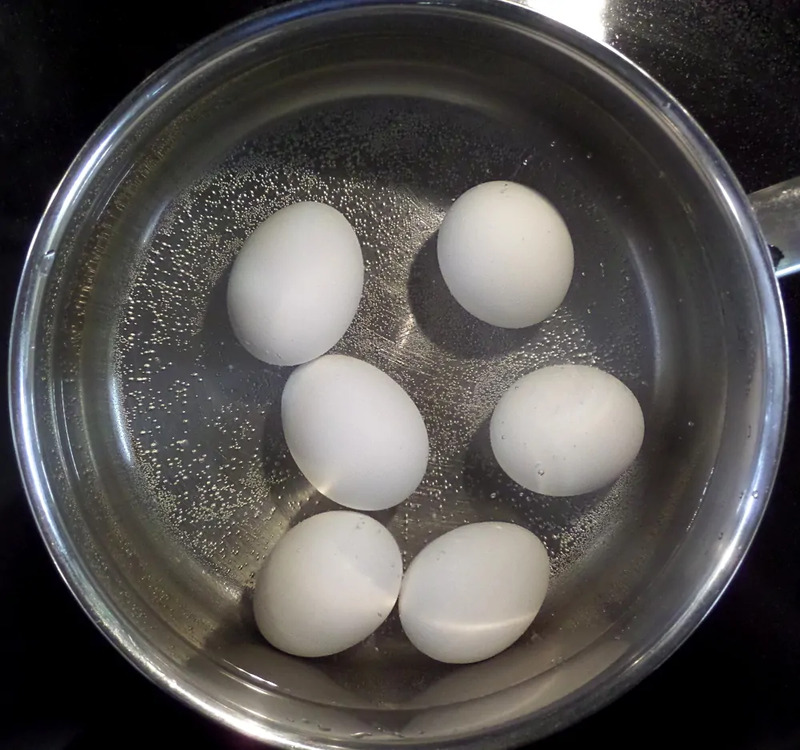 Place eggs in a saucepan and fill with enough water to cover an inch over the eggs. Over high heat, bring water to a full boil. Remove pan from heat, cover and let sit for 12 minutes. After 12 minutes, remove eggs from sauce pan and cool eggs in a bowl of ice water. 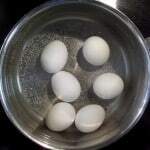 Fill a saucepan with enough water to cover eggs by one inch, but do not add eggs yet. Bring water to a full boil. Add eggs. Reduce heat to medium and maintain a low boil/simmer for 11 -12 minutes. After 11 minutes, remove eggs from sauce pan and cool eggs in a bowl of ice water. Method 1 was perfectly cooked – egg whites and yolks. The problem with my preferred method is painfully apparent – they don’t peel well. Chunks of egg whites comes off with each fleck of shell. It’s a mess. I now officially feel guilty for all the Easter Eggs made with this big no of a method. Method 2 is clearly the winner. The eggs peel effortlessly – the shell almost slides off. The eggs yolks are cooked perfectly and the whites are close to it. You couldn’t ask for anymore on your quest for the Perfect Hard Boiled Egg. End of story. Thanks for stopping by! I hope you enjoyed this “eggs-periment” (hehehe, super cheesy, I know) and I’d love to hear your thoughts and comments! Happy Cooking! 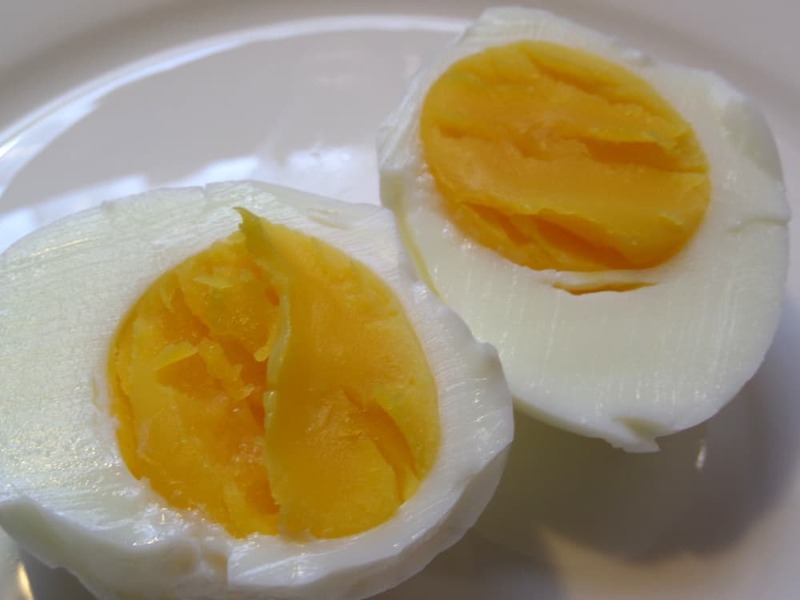 Perfectly cooked and easy to peel hard boiled eggs. Bring water to a full boil. Gently add eggs - I lower them in with a spoon. Reduce heat to medium/medium-low and maintain a low boil/simmer for 11 - 12 minutes. After 11 minutes, remove eggs from sauce pan and cool eggs in a bowl of ice water. Refrigerate until ready to peel and use. Welcome to Crafty Cooking Mama. I’m Amanda, a wife and mama loving life in beautiful Lancaster County, Pennsylvania.